Cut the bread into cubes and fry in a pan with a little olive oil, then place the bread in the freezer bag. Fry the diced bacon in the same pan and also add it to the freezer bag. Add the chopped peppers and chopped onion, along with the eggs, grated cheddar, milk and cream to the bag and season with salt and pepper. 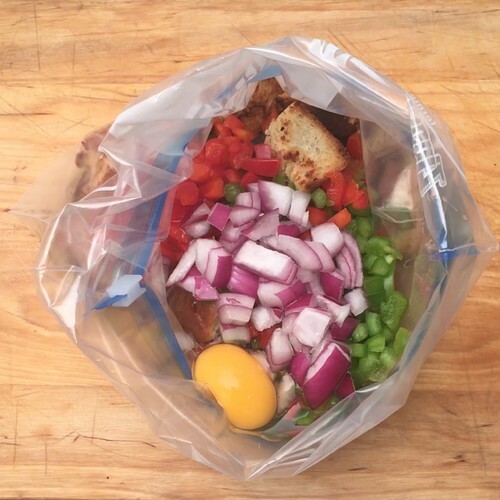 Close the freezer bag and mix everything together well, then leave in the fridge for 30 minutes. In a round tin or pie dish, add the mix from the freezer bag and spread it in an even layer. Add the grated mozzarella on top and sprinkle with chopped chives. Bake the mix in the oven or 30 minutes at 180°C, then serve in slices with salad on the side.